Viet Nam became a member of the International Union for the Protection of New Varieties of Plants (UPOV) in 2006. 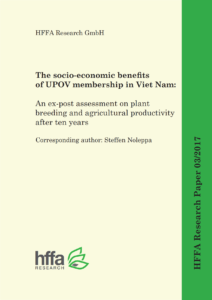 In honour of the tenth anniversary thereof this HFFA Research Paper analyses the socio-economic benefits of Viet Nam’s UPOV membership. Overall, the analysis confirms the results found to be true for other industrialized countries as well, which is that investments in sophisticated plant breeding offer various benefits and values. The corresponding author, Steffen Noleppa (HFFA Research), finds that the yields in Vietnamese arable farming have increased since becoming a UPOV member. For example, rice yields increased by 18 percent and corn yields have grown by 30 percent. Sweet potato yields have increased most dramatically by 43 percent. 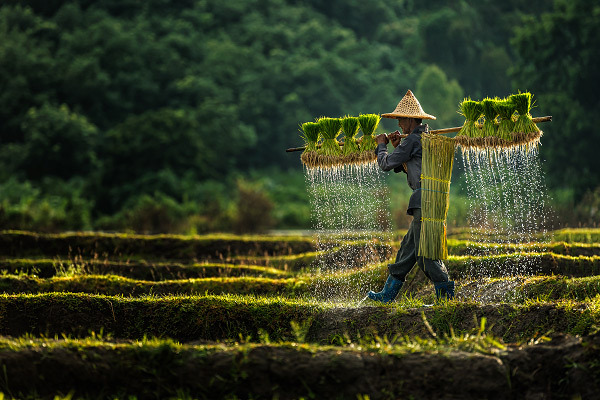 When calculated by yearly growth, the Vietnamese improvements regarding land productivity in the past decade are higher than the corresponding changes of global yields for the three aforementioned crops, respectively. Before becoming a UPOV member, increased yields in Viet Nam were attributed to increased input use. Since 2006, however, input use has decreased by 1.2 percent annually. A comprehensive literature review concludes that upon becoming a UPOV member, 65 percent of innovation-based land productivity gains for rice can be attributed to plant breeding. For corn and sweet potatoes these values are at 70 and 60 percent, respectively. Viet Nam’s UPOV membership had a major impact on total sectoral income. Since becoming a member, the total sectoral income increased by over USD 2.3 billion with rice as the major contributor at a USD 1.9 billion increase. This improved productivity and sectoral income also leads to very positive effects for the entire country’s GDP. Up- and downstream industries were able to additionally generate USD 3.4 million. Clearly, their membership has not only led to large sectoral but also to societal benefits. The Conclusions of this study can be downloaded below.